The future is a rough place in Richard Fleischer’s 1973 film Soylent Green. Especially New York City in the year 2022. The population is 40 million, the city is in the grip of an endless heat wave, and apparently the only things to eat are colored crackers. At least the green kind, Soylent Green, to be particular, seem pretty popular. Man, of course, is to blame for the calamities of this bleak future, as the film demonstrates in an opening photographic montage that is artistically compelling. The city is so crowded that hallways and stairwells overflow with sleeping humanity in the night, after the curfew sirens wail. The petty necessities of our current existences, which we take for granted, are precious luxuries in the world of Soylent Green. While the crowded masses subsist on the variety of tasteless Soylent crackers, even wilted vegetables and less than prime cuts of beef are rare acquisitions for the powerful. Profound ecstasy can be found in the simple pleasures of eating real food, drinking real booze, feeling the cold blast of air conditioning, or taking a shower with real running water. This is humanity on the brink, and it’s Charlton Heston’s job to expose the horror hidden beneath the surface of already horrifying times. Yes, Charlton Heston, rounding out his trilogy of post-apocalyptic/dystopian tales that began with Planet of the Apes (his role in Beneath the Planet of the Apes can hardly be considered a lead performance, so doesn’t get counted here) and continued with The Omega Man, plays Detective Robert Thorn in Soylent Green, a jaded policeman with little interest in solving his cases, and a keen desire to use the job to acquire goodies that he can live off of. It’s not that he’s a bad cop. In Soylent Green, he’s a typical cop. The police in this future world are shamelessly corrupt, delighting in pilfering the apartments of rich murder victims, including the women that come with the lease. It’s institutionalized. One way to tell this is a truly fictionalized world is that, at first, the police don’t really seem to care that an extraordinarily powerful white man has been beaten to death in his home. Imagine that, a world where the rich are treated with the same disdain by the police as everyday schlubs and poor folks. Science fiction, indeed. Thorn is tasked with finding out who killed the rich white guy, played by Joseph Cotten, and enlists the help of his roommate/researcher, Sol Roth, played by Edward G. Robinson. This is Robinson’s last film, and his performance was the best in the film. His portrayal of an old man, withering under the downfall of humanity, tortured by his memories of not just better days gone by, but worthy days, days when the human race had something to live for, is strong. His stooped and shortened form seems to carry the weight of civilization’s loss on its shoulders. When he discovers the secret motive behind Cotten’s murder, what little will he has left to live in a world he despises, mourning for a world long gone, disappears. The film avoids resolving itself in predictable fashion. It could easily have descended into a morality play on either the evils of big business or the dangers of environmental destruction. While both are the basis for the bleakness of the setting, the actual causes and motivations behind Cotten’s murder are revolting, and well-deserving of the zeal with which Heston chases down the truth. 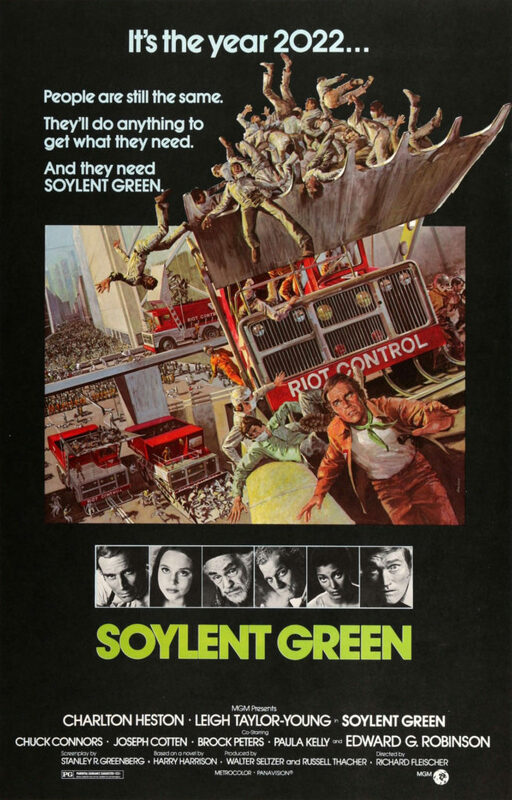 Soylent Green is dated, but no more so than any science fiction film after a few decades or so have passed since it was made. It’s a well-written, well-directed, and well-acted film. In fact, it’s surprising how well made it is. If it suffers anywhere, it is in the strictly backlot production. At times the production looks like a stageset for a cheap television detective show. It lacks the grandeur or expansiveness of other sci-fi films, and one has to wonder if the bulk of the budget went towards names rather than look and feel. Either way, SOYLENT GREEN IS PEOPLE!!!!!! !